I ordered birria, carne asada, and carnitas with a cold bottle of lime jarritos. When the weather is as hot as it has been here in LA there’s no greater pleasure than that first swig of an ice cold bottle of good soda. My tacos came wrapped in foil but in fairness to the girl that took my order I don’t think I said if I wanted them para aqui. The salsa bar was a little messy. 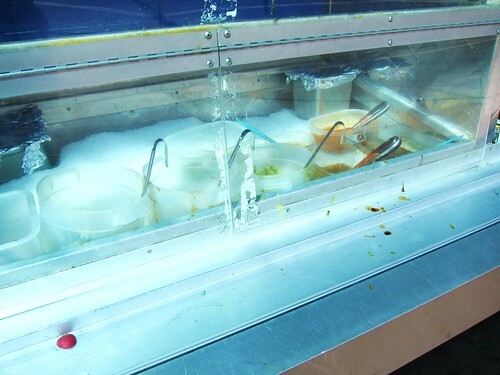 The tubs of salsas were placed on ice in a public compartment for patrons but there was a lot of salsa and condiment spillage on the ice and the counter. There were so many salsas - some in big tubs, some in small tupperware containers that it was all too confusing . It was also pretty difficult to reach into the compartment and fill a cup of salsa. If Tacos Colima wants to provide such an eclectic mix of salsas I’d advise them to go to squeeze bottles - they are more sanitary and easier to use. 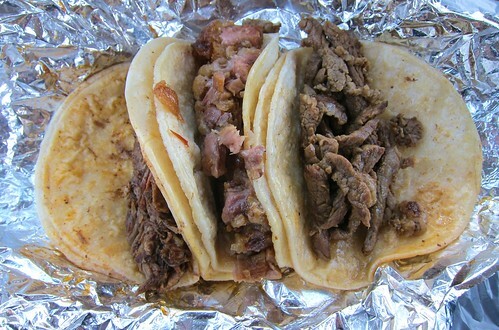 I was surprised how good these tacos were (not the carnitas, which was just weird). 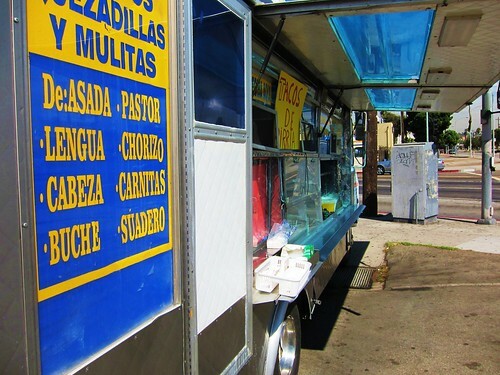 The tortillas were fresh, the birria and carne asada were fresh and the tacos were big and full of meat. The asada had that right off the grill taste. The strips of beef were tender with juicy flavor. The birria had a cumin flavor with a little sweetness to it. It didn’t rank up there with some of the best birria I’ve had at restaurants but I’m not sure I’ve had a better taco de birria from a taco truck. The seasonings hid the naturally gamey flavor of birria which may be a good thing or it may not be. Like I said already, the carnitas was just weird. 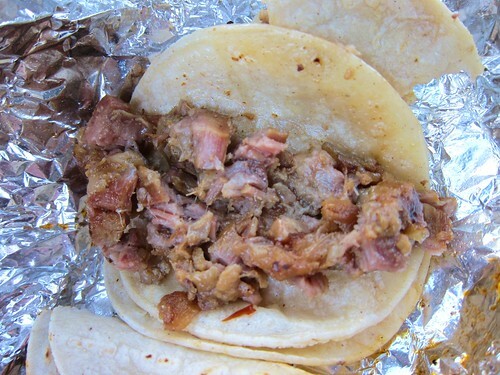 I’ve never seen carnitas this dodgy looking - the porks edible bits were held together by strands of fat and glob. I took one bite and was done. The tacos also didn’t come with onions or cilantro and I didn’t see any onions or cilantro in the compartment. For a daytime truck even if I had found a bin of onions and cilantro I wouldn’t go near it. They need to add the onions and cilantro. 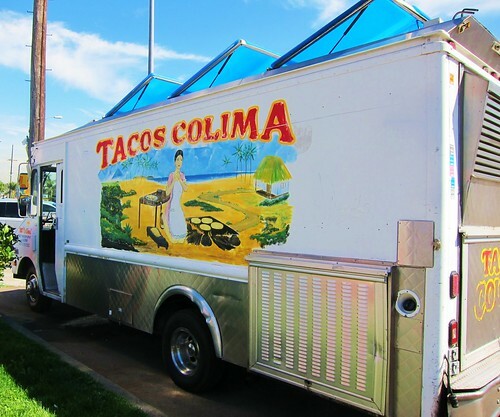 Tacos Colima has potential at this corner. During the day they are pretty much the only game in town . My criticisms are more cosmetic; clean up the salsa bar (preferably switch to squeeze bottles), and add onions, and cilantro to tacos. But there was a lot of good also. 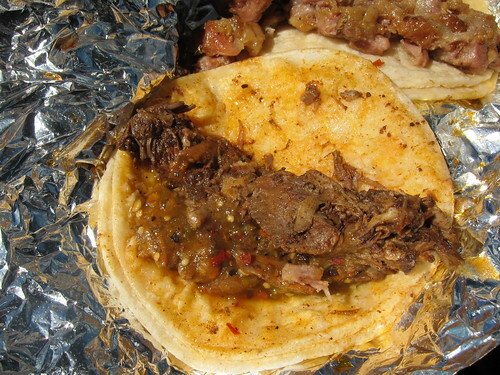 I’d happily order this carne asada taco again and the birria was a welcomed surprise. didn't check the foil wrapped bins - but they were out of reach anyway and had no utensils.